Orange Blossom Water Turns Four! 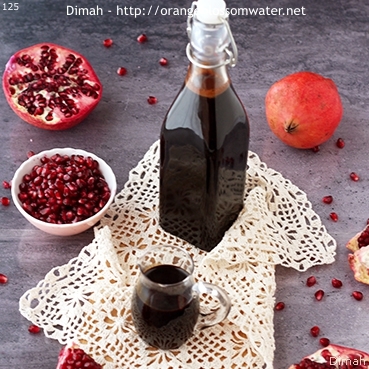 Dibs Ar-Remman “Pomegranate molasses” is one of those precious ingredients in Syrian cuisine. 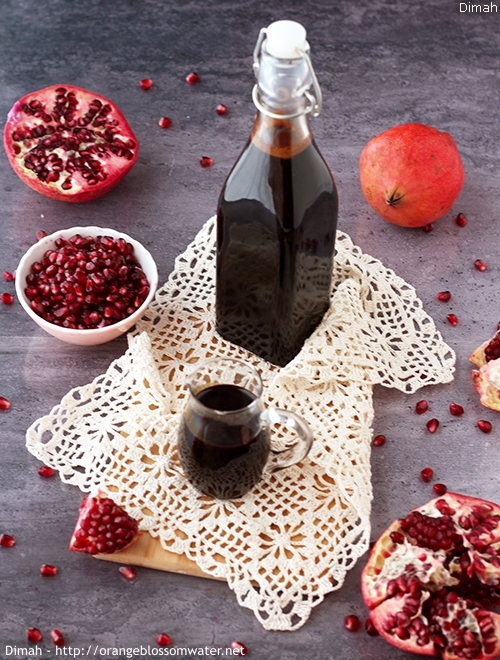 It is pomegranate juice “from a tart variety of pomegranate” that is boiled down and reduced to a thick, dark syrup. 1, 2, 3, 4. 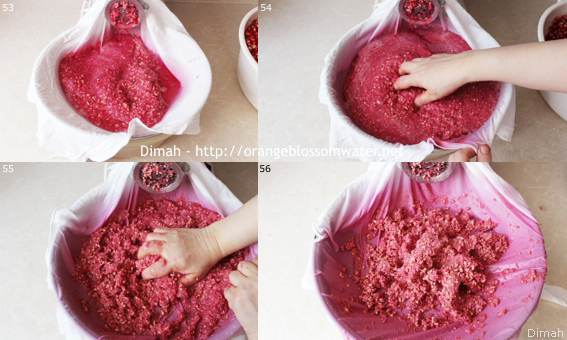 Bring 10 kg sour pomegranates, and wash them. 5 to 12. 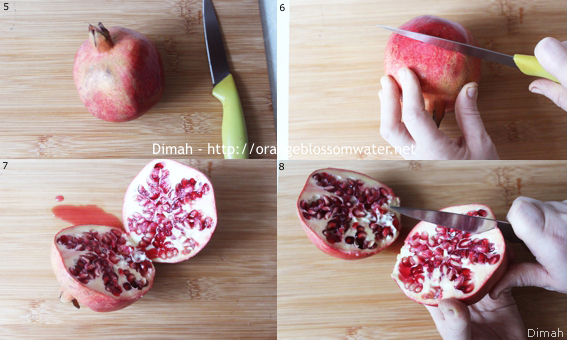 Take a sharp knife and tear the pomegranate apart into different sections. 13 to 18. Remove the arils by prying them loose from the rind. Collect the arils in a large bowl. There are two methods to juice the arils. 19, 20. 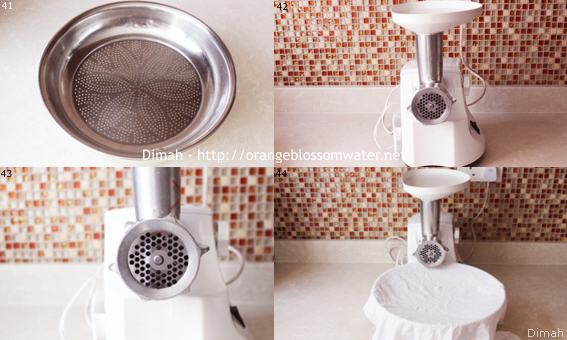 Place a stainless steel mesh strainer over your jug and line it with a clean cloth. 21, 22, 23, 24. 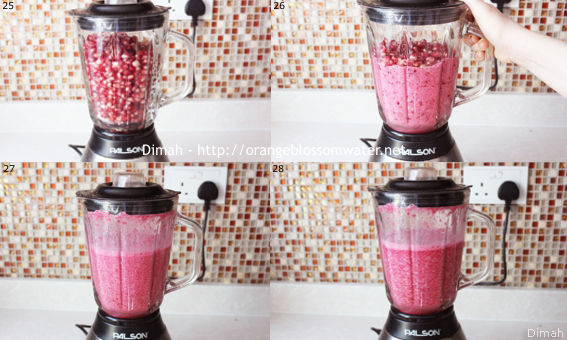 Put pomegranate arils in the blender. 25, 26, 27, 28. Run your blender few times. Make sure not to break the white seeds which are inside the red membrane, otherwise if they are broken that will affect the taste of the molasses and it will be bitter. 29, 30. 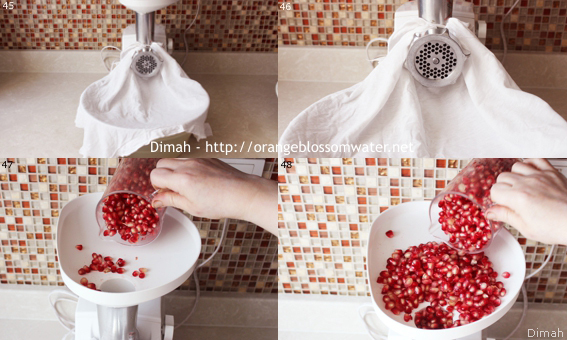 Pour pomegranate juice through the strainer. 32 to 40. Use a spoon and your hand to press the pulp against the strainer to extract as much pure juice as possible. 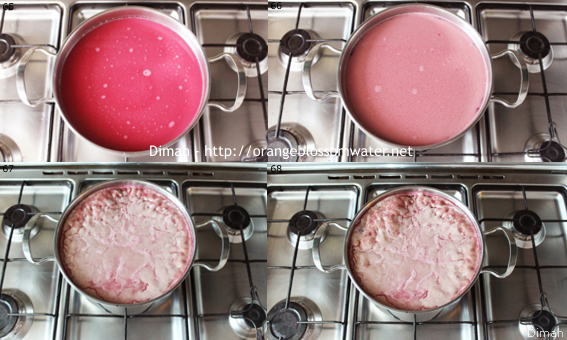 The other method to juice pomegranate arils is easier and faster. 41. Place a strainer over a large bowl. 42, 43. Attach the medium holed plate to meat grinder. 44. 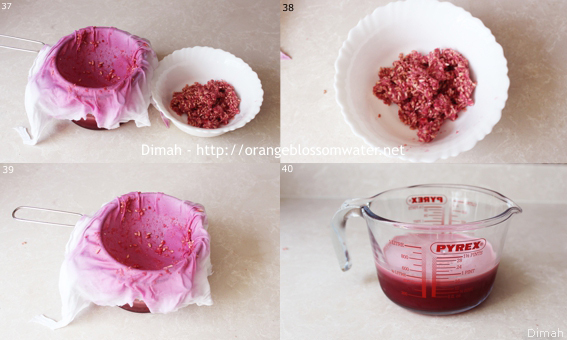 Put a bowl with the strainer below the meat grinder plate and line it with a clean cloth. 45, 46. Wrap the cloth around the neck of the meat grinder attachment. 47, 48. Add pomegranate arils to the grinder. 49, 50, 51, 52. Grind the arils. 53, 54, 55, 56. 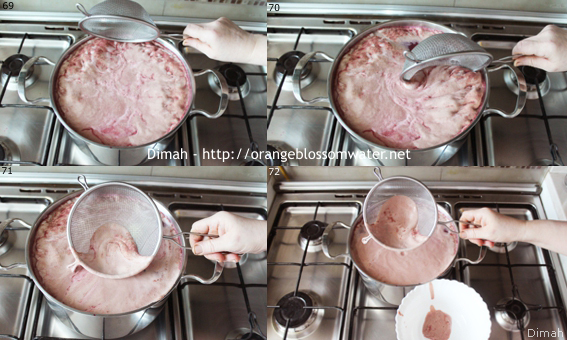 Use your hand to press the pulp against the strainer to extract as much pure juice as possible. 57, 58, 59, 60. Discard the pulp and collect the pure juice in the large bowl. 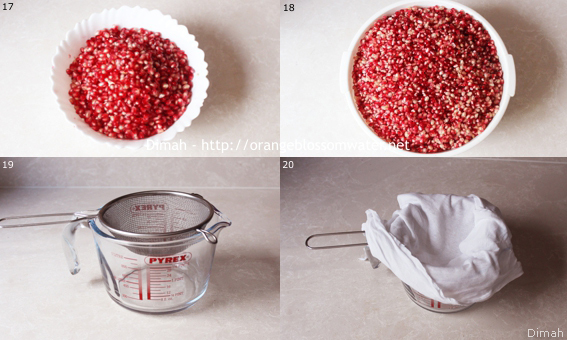 The amount is 5 kg pomegranate juice. 61, 62, 63, 64. 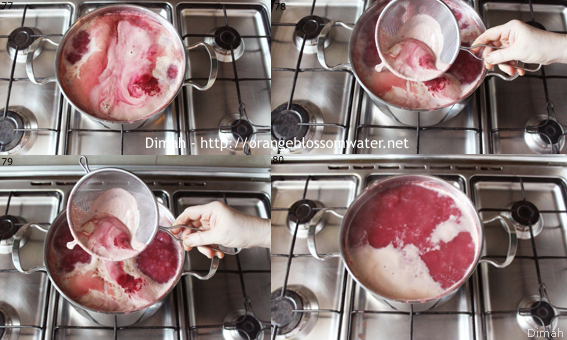 Pour pomegranate juice to a stainless steel pot. 65, 66. Turn on heat and keep on high heat until boiling. 67 to 72. During boiling, a foam will occur on surface. Use a stainless steel mesh and skim any foam that rises to the surface. 73 to 84. Once boiling vigorously, reduce heat and keep on low heat and start to count time. 85. Allow to simmer over low heat. 86, 87, 88. At this stage, use a spoon to skim the foam. 89 to 95. 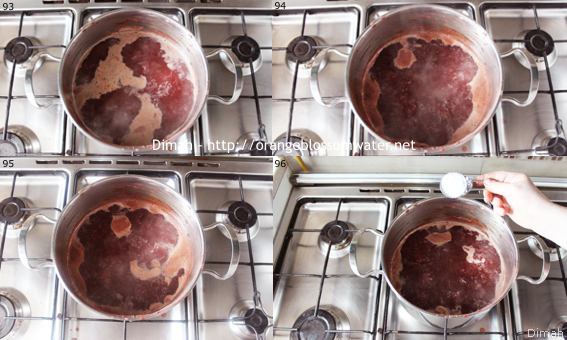 The color will change during simmering. It will turn from magenta to brown. 96. After 2 hours of simmering, add sea salt to pomegranate juice. 97, 98, 99, 100. The color will get darker by time. 101, 102, 103, 104. Keep simmering over low heat till the liquid reduces by 85%. It will take about 3 to 5 hours, that depends on the volume of the juice and the size of the pot. 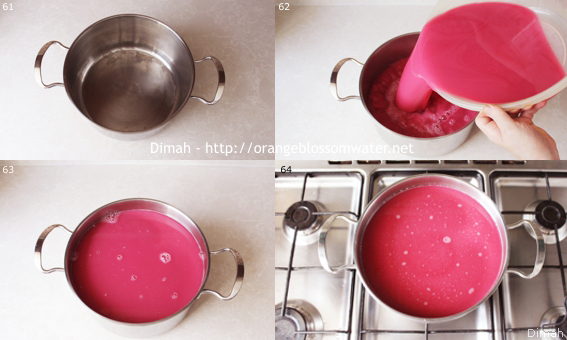 The liquid is ready when it has syrupy consistency, do not let it to thicken too much, or it will harden when it cools. Keep any eye on the molasses carefully and do not overcook it. 105, 106, 107, 108. 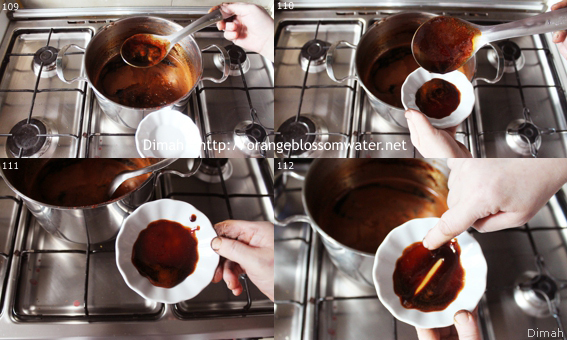 Check if the molasses is done by testing on a spoon, molasses should be able to coat the spoon. 109, 110, 111, 112. Check the molasses if done by adding few drops of molasses into a plate and allow to cool, you will notice that it is thickened, the consistency of molasses should be similar to a runny honey. 113, 114. Pomegranate molasses will continue to thicken as it cools but it still pourable. If the molasses is overcooked, once cooled you will end up with a very thick and stiff substance that is very difficult to work with. 115, 116. Prepare a bottle and a tunnel. 117, 118, 119, 120. Pour hot molasses to the bottle. 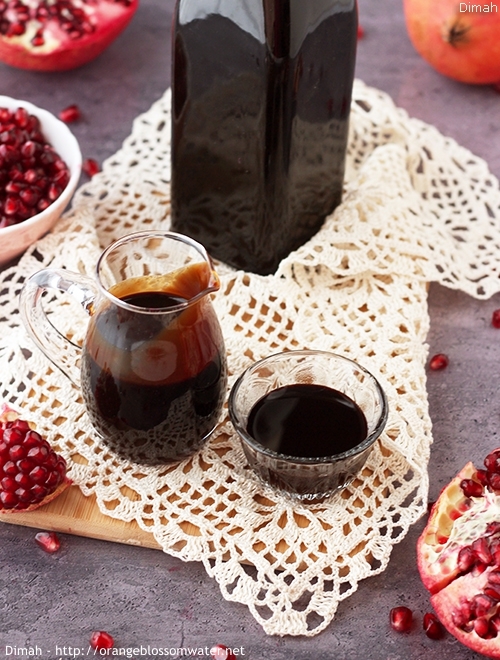 The amount of pomegranate molasses is 1500 ml. 121, 122. 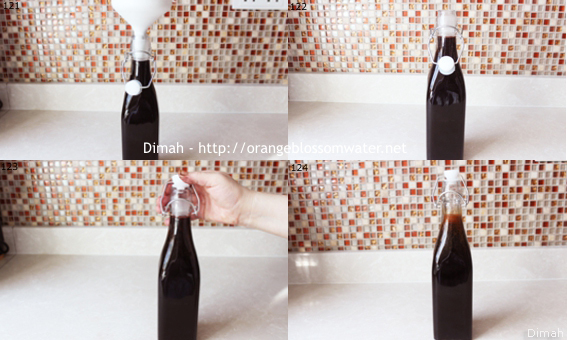 Keep the bottle opened until the molasses completely cooled. 123, 124. When the molasses cools, close the bottle and store in cool dry dark place. 125. Use Dibs Ar-Remman in different recipes such as: Daqqah Hamwiyeh Fattoush Maleh, Baba Ghannouj, Bamieh Bel-Bandourah, Bathenjan Mshattah Fattet Al-Makdous, Fattoush Kudar II, Itch, Kibbeh Bi-Safarjaliyeh, Kousa Mtabbaq, Lahem Bi-A’jin / Sfiha, Mehshi Al-Burghul Bi-Zeit Az-Zeitoun, Mhammarah, Mjaddareh Al-Aruz and Mjaddaret Al-Burghul, Sheikh Al-Mehshi, ‘Esh Al-Bulbul, Yalanji. 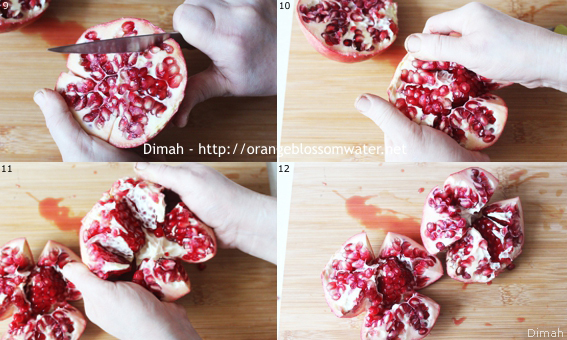 Take a sharp knife and tear the pomegranate apart into different sections. Remove the arils by prying them loose from the rind. Collect the arils in a large bowl. Place a stainless steel mesh strainer over your jug and line it with a clean cloth. 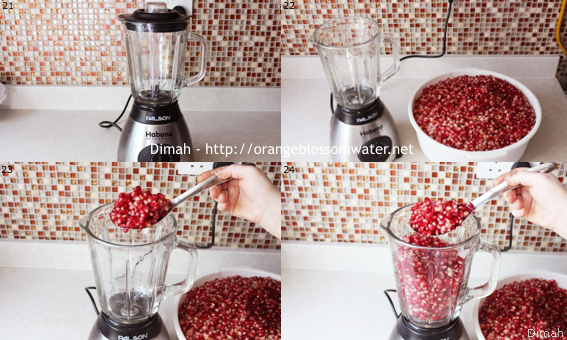 Put pomegranate arils in the blender. Run your blender few times. Make sure not to break the white seeds which are inside the red membrane, otherwise if they are broken that will affect the taste of the molasses and it will be bitter. 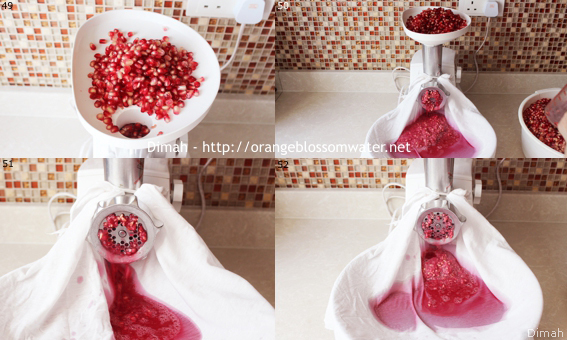 Pour pomegranate juice through the strainer. 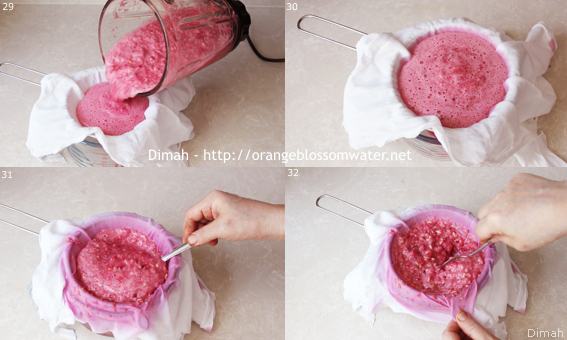 Use a spoon and your hand to press the pulp against the strainer to extract as much pure juice as possible. Place a strainer over a large bowl. Attach the medium holed plate to meat grinder. 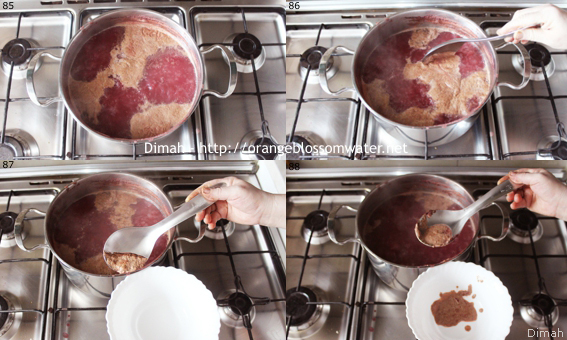 Put a bowl with the strainer below the meat grinder plate and line it with a clean cloth. Wrap the cloth around the neck of the meat grinder attachment. Add pomegranate arils to the grinder. 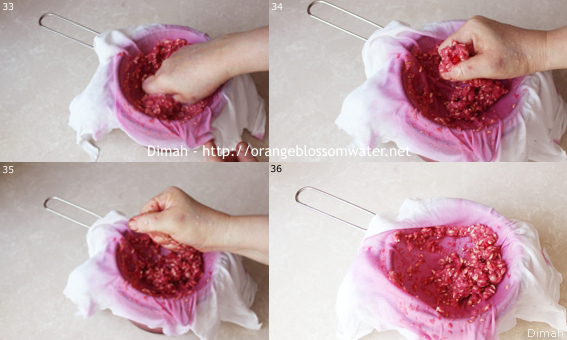 Use your hand to press the pulp against the strainer to extract as much pure juice as possible. Discard the pulp and collect the pure juice in the large bowl. The amount is 5 kg pomegranate juice. 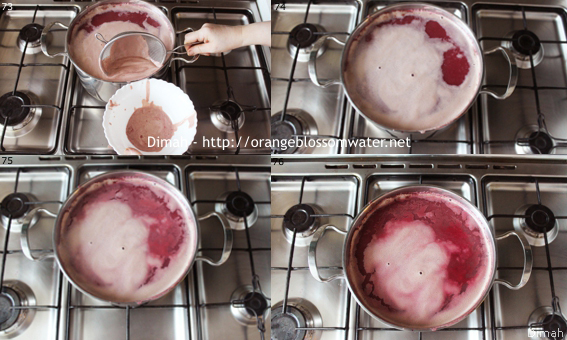 Pour pomegranate juice to a stainless steel pot. Turn on heat and keep on high heat until boiling. During boiling, a foam will occur on surface. Use a stainless steel mesh and skim any foam that rises to the surface. Once boiling vigorously, reduce heat and keep on low heat and start to count time. Allow to simmer over low heat. At this stage, use a spoon to skim the foam. 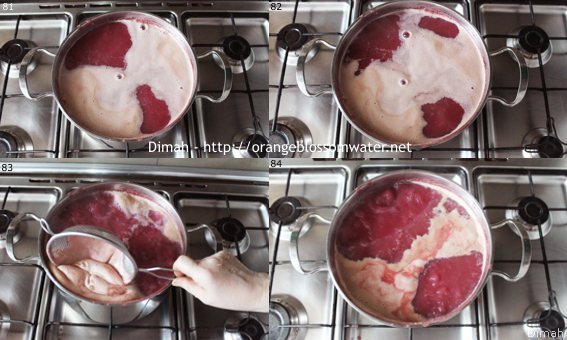 The color will change during simmering. It will turn from magenta to brown. After 2 hours of simmering, add sea salt to pomegranate juice. The color will get darker by time. Keep simmering over low heat till the liquid reduces by 85%. 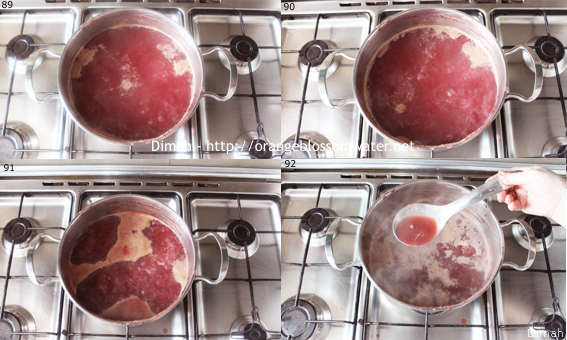 It will take about 3 to 5 hours, that depends on the volume of the juice and the size of the pot. 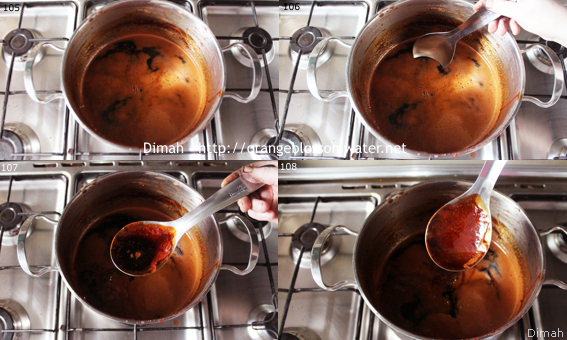 The liquid is ready when it has syrupy consistency, do not let it to thicken too much, or it will harden when it cools. Keep any eye on the molasses carefully and do not overcook it. 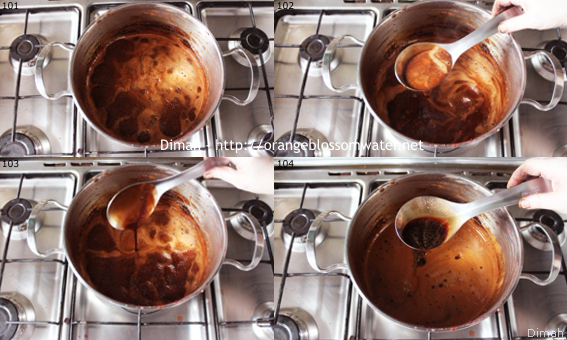 Check if the molasses is done by testing on a spoon, molasses should be able to coat the spoon. Check the molasses if done by adding few drops of molasses into a plate and allow to cool, you will notice that it is thickened, the consistency of molasses should be similar to a runny honey. 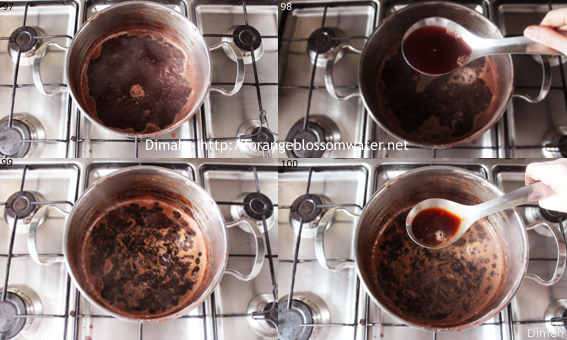 Pomegranate molasses will continue to thicken as it cools but it still pourable. If the molasses is overcooked, once cooled you will end up with a very thick and stiff substance that is very difficult to work with. Prepare a bottle and a tunnel. Pour hot molasses to the bottle. 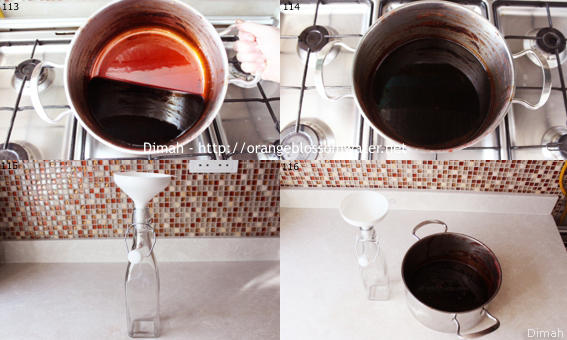 The amount of pomegranate molasses is 1500 ml. Keep the bottle opened until the molasses completely cooled. When the molasses cools, close the bottle and store in cool dry dark place. 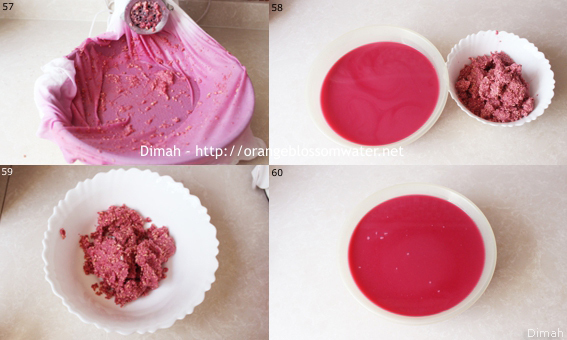 Use Dibs Ar-Remman in different recipes such as: Daqqah Hamwiyeh Fattoush Maleh, Baba Ghannouj, Bamieh Bel-Bandourah, Bathenjan Mshattah Fattet Al-Makdous, Fattoush Kudar II, Itch, Kibbeh Bi-Safarjaliyeh, Kousa Mtabbaq, Lahem Bi-A’jin / Sfiha, Mehshi Al-Burghul Bi-Zeit Az-Zeitoun, Mhammarah, Mjaddareh Al-Aruz and Mjaddaret Al-Burghul, Sheikh Al-Mehshi, ‘Esh Al-Bulbul, Yalanji. 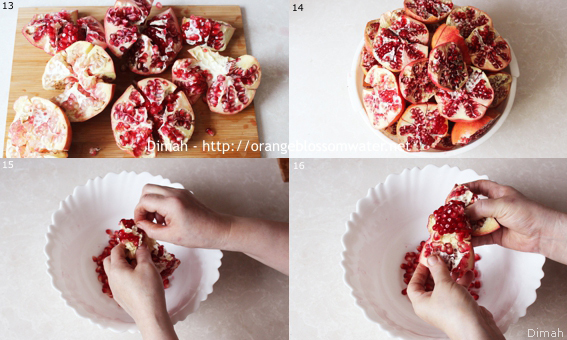 Make sure to use sour pomegranate. In Syria, pomegranate molasses is prepared during October in the season of sour pomegranate. 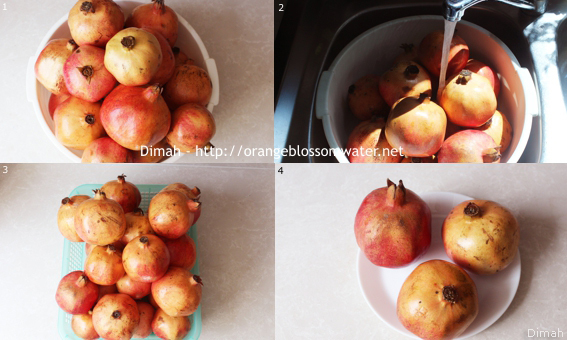 10 kg pomegranates is approximately 5 kg pomegranates juice that gives 1500 ml pomegranate molasses. 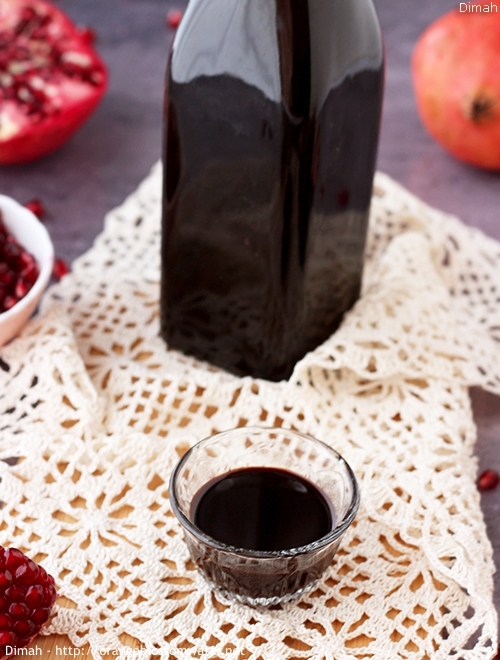 You can store pomegranate molasses in cool dry dark place for few years. This entry was posted on Tuesday, January 1st, 2013 at 7:12 PM	and is filed under Syrian Ingredients. You can follow any responses to this entry through the RSS 2.0 feed. You can skip to the end and leave a response. Pinging is currently not allowed. great tuturiol..now where and when and how can we use this? Gerald: Thank you for your kind words…Happy New Year! 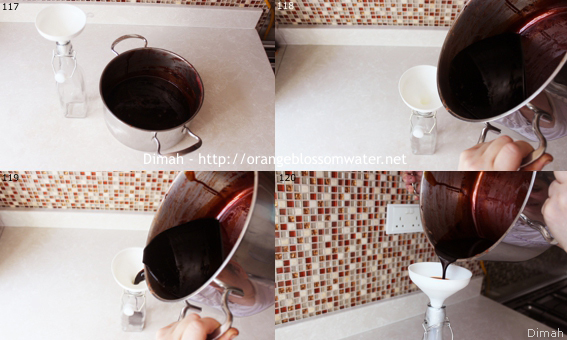 miriam: I linked in the post to different recipes where pomegranate molasses can be used…Happy New Year! Ooh, I cook with dibs-al-rumman often, but have never made it. what a great tutorial! 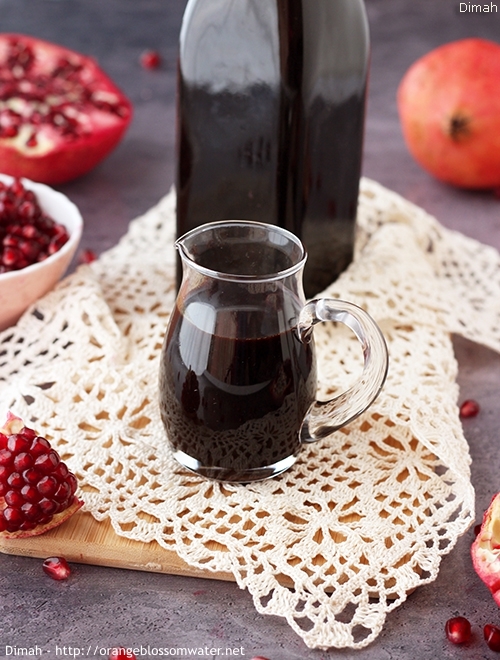 Pomegranate molasses is one of my favorite ingredients! I love to use it in salads, over olives, in stuffed grape leaves, so many other dishes. I haven’t tried to make it yet as mom always makes it for us. Thank you for these step bu step pictures, I can try to make it myself now! Wow. 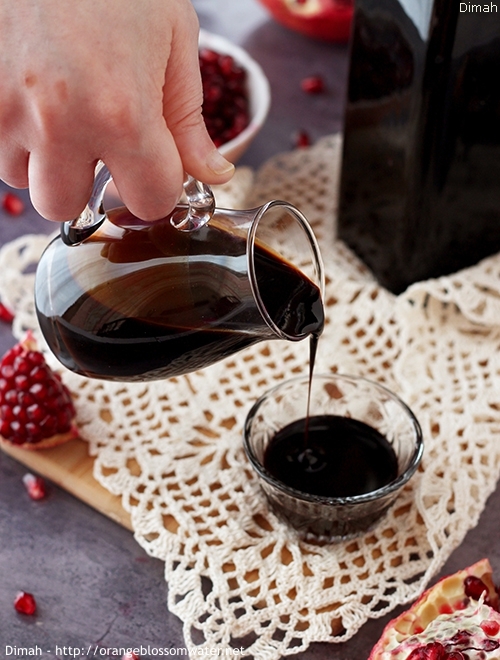 Always wondered how to make pomegranate molasses.will definitely try it. Yasmeen @ Wandering Spice: Thank you for your lovely comment! zerrin: Thanks so much for stopping by and for your kind comment! Hajer: Thank you so much for coming by! Humi: Thank you for stopping by! Hope you give it a try!